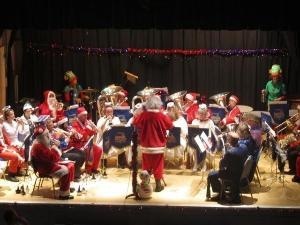 The JIB held its annual Christmas Concert to a packed Jedburgh Town Hall on Sat 17th Dec. The Band was accompanied by Abbey Brass, the Future Group and the Band Buddies and together they put on a memorable show. All the Junior bands showcased there latests works much to the delights of the large audience and with the senior band laying on the Festive cheer, the Audience left with all the joys of the Festive Spirit. Such Numbers as Away in a Manger, O Holy Night and In the Bleak Mid Winter set a great Christmas scene and followed by excerpts of Santa Baby, Fairy tale of New York and I Wish it could be Christmas everyday, had everyone singing along. The Band would like to thank all the fund raisers and bar staff for their continued and valued support and to Jim Terrace and Alan Fernie for guesting with the band. The Band recently held a days fundraising at the Jedburgh Co-op Superstore with Christmas Carols being played by the JIB and Customer bag packing being carried out at the tills by members and parents of Abbey Brass. A GRAND TOTAL OF £870 was raised so a huge thank you goes to all who were involved and to the Co-op Store Jedburgh for their kind hospitality. Abbey Brass (Jedforest) claimed another Gold Award at this Years Scottish Youth Championships in Perth. There were a total of 11 bands in their section, unfortunately the band didn't quite manage to take home the Trophy, that honour went to the Perth and Kinross Junior School Band but a cracking performance from the band meant they claimed one of the top awards of the day. This wasn't the only success for the JIB as three of the bands players were also involved the previous day playing for the Scottish Borders Youth Band in the Senior Development Section. Tammie Jack, Emma Stainer and Naomi Henderson help the Borders band retain the title for a second year. The JIB walked away from the Borders contest on Saturday 5th November with the 3rd section title after wowing the large audience with a fun-packed and hugely entertaining programme. Playing no. 15 out of 18 bands, the band opened their programme with a fabulous arrangement by Philip Harper of the Barry Manilow classic 'Copacabana'. With its vocal opening, the band quickly had the audience's full attention. Next, the band showed off its quality Solo Horn player, Hamish McRitchie, by playing the Goff Richard's piece 'Demelza'. A beautiful Solo which Hamish played with style and composure. The band closed its programme with the Salvation Army piece ' Glorifico Aeternium'. This was a big number for the band and they had put a lot of hard work into this piece and pulled it off well. Overall a hugely entertaining programme that tested the band and showed off the hard work that was put into it by all the players and MD Phil Rosier. The JIB would like to thank Alison Reid (Langholm Town), John Dickson (St Davids Brass) and Alan Fernie for guesting with us at the contest. In a Brass Banding first, the Contest held an open adjudication with 2 adjudicators, Archie Hutcheson and Stan Lippeatt. Stan was adjudicating as normal but Archie was trailing a new idea, supported by SBBA, by talking his remarks over a recording of the bands as they played. Click the Link to hear this unique adjudication. We also have videos of our performance on the day, so for your viewing pleasure please just click on the links below. The Jedforest Instrumental and Abbey Brass bands are both taking part in the 11th annual Borders Entertainment Contest which this year is being held for the first time in the Buccleuch Centre Langholm . Last year the Band was awarded Best 3rd Section Band, Best percussion and Highest placed Borders Band so they have a tough task to emulate last years performance. Abbey Brass, hot off a famous win at Brass in the Park look to continue their winning ways with another title in Langholm. 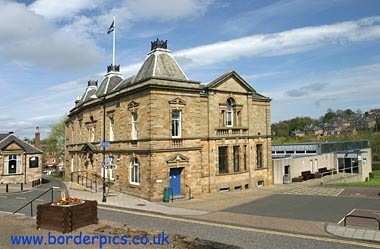 The Band will be holding a Concert in the Jedburgh Town Hall on Fri 21st Oct. The Band will be conducted by MD Phil Rosier and will be showcasing some of the music that it will be performing at the forth coming Borders Entertainment Contest. Alongside the band as always will be Abbey Brass (Jedforest) Conducted by Rob Hume and after their recent success at Brass in the Park they are in top Tune.